Size 3 units, as seen on size 2 nibs, have different dimensions depending on whether they were made before or after the Second World War. But there might be some other reasons as well. Non dated steel (shiro) nib. Probably from the very late 1930s or early 1940s. The engraving reads "BEST / INTHEWORLD / PILOT / -(3)-". 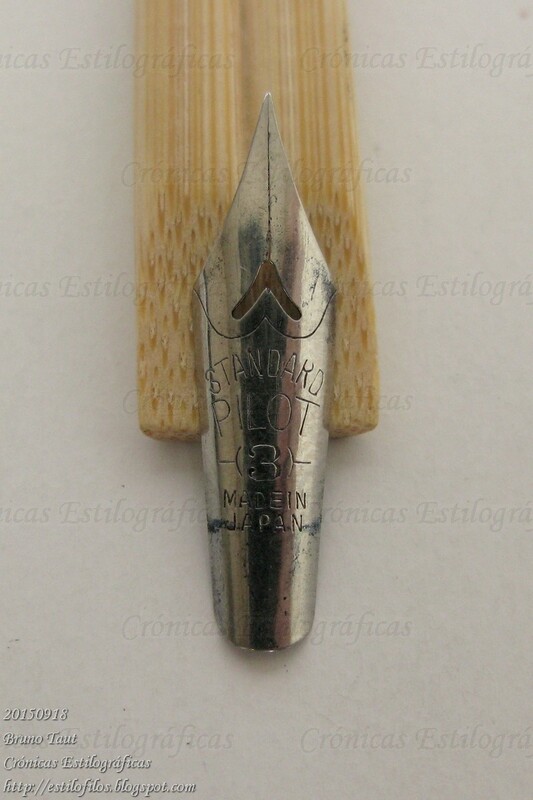 Steel nib made in 1950. The engraving now includes a reference to the place of production: "STANDARD / PILOT / -(3)- / MADE IN / JAPAN". Pilot RT from ca. 1940. The original price was JPY 4.55. 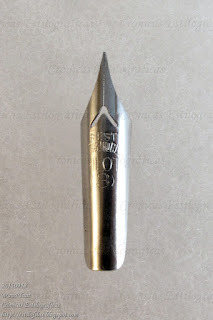 The second nib correspond to this Pilot that implements the A-shiki filling system. This pen also preserves the original price: JPY 150. 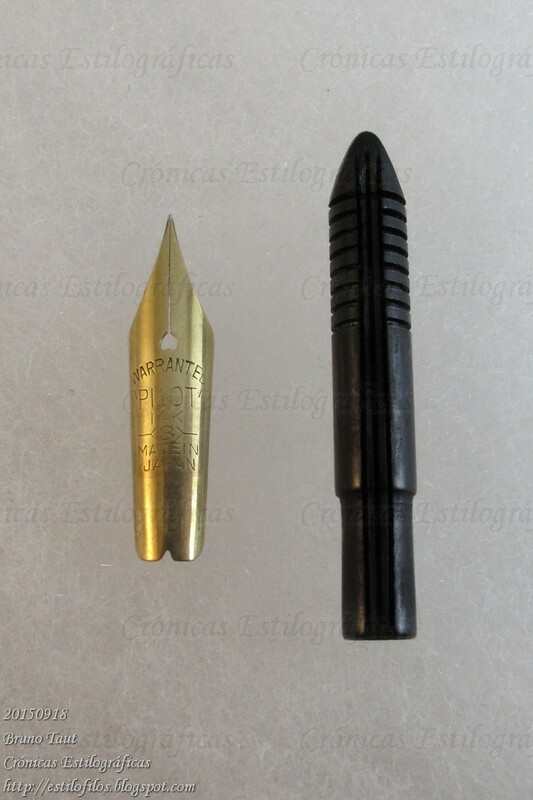 The first nib is not dated, but the pen is clearly an R model from the late 1930s. It still carries the sticker—its price, JPY 4.55. The second pen is an R model, with an A-shiki filling system. It still preserves the original price sticker: JPY 150. Ten years, a war in between, and a price difference of a factor of over 300. 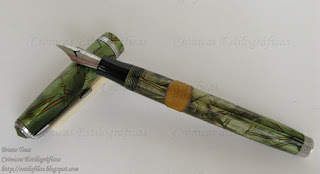 The following pen is more clearly a post-war unit. It is a 53R model whose nib was made in January of 1953. The embargo over the use of gold had been levied in 1952. Post-war (January of 1953) size 3 nib made of 14 K gold. Note the thinner diameter of the feed in the area usually under the section. 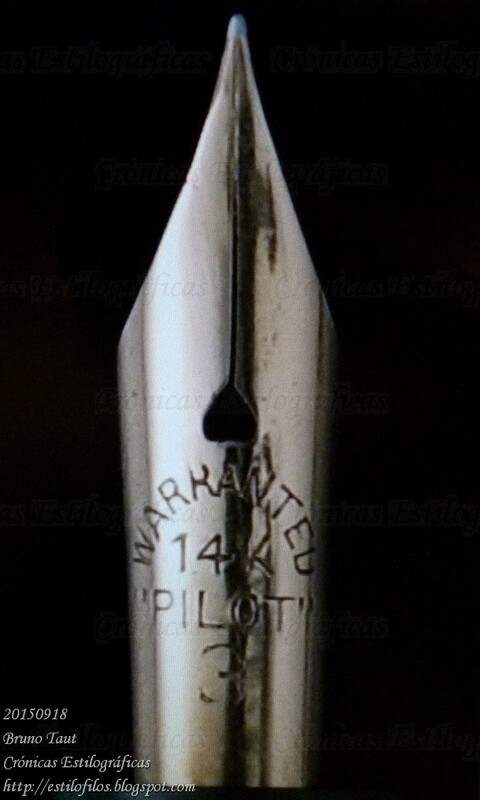 The engraving, "WARRANTED/ "PILOT" / 14 K / -<3>- / MADE IN / JAPAN". The feed of this pen also shows a thinner diameter in the area attached to the section, as was the case of nibs of sizes 2 and smaller. 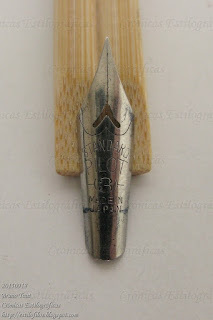 The last example of size 3 nib belongs to a pen exhibited at the Pen Station, the pen museum of Pilot in Tokyo. It corresponds to a maki-e pen from 1926. May it serve to illustrate the differences on the engraving. Needless to say, I cannot measure the actual dimensions of this nib. Pilot nib from a maki-e pen from January of 1926, exhibited at the Pen Station, the Pilot museum in Tokyo. 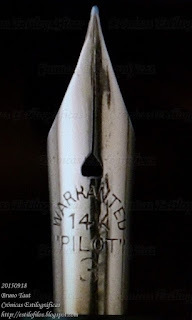 The engraving, much simpler, reads "WARRANTED / 14 K / "PILOT" / 3". Great Article. I have , what I am told, is a 53r pen with a wartime shiro nib. 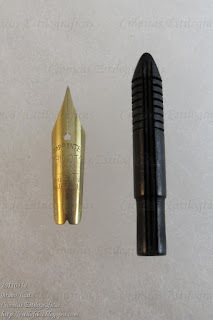 The nib is damaged and needs a replacement. How hard is it to find a nib for this pen? I am in the US so they are not so common here and I am looking for a source. Thanks, Unknown, for passing by and commenting. Those pens --wartime celluloids by Pilot-- are not difficult to find at flea markets in Japan. Some of those are in poor condition and are a good source of spare parts.